Arsenal put in an outstanding display as they ran out comfortable 2-0 winners over Chelsea at the Emirates Stadium. The Gunners made a quick start to the game and went in front just after the ten minute mark. Hector Bellerin put a powerful cross into the box which Alexandre Lacazette controlled brilliantly, before he then shot on the turn and beat Kepa Arrizabalaga at his near post to send the Emirates into a frenzy. ​Chelsea began to see more of the ball after falling behind but were left frustrated by a stern ​Arsenal defence who weren't letting anything get past them. Then on the stroke of half time, the home side doubled their lead. 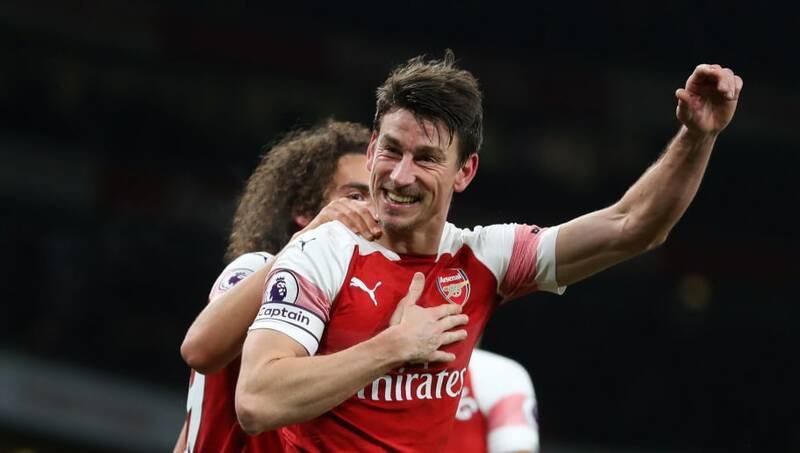 A free kick was whipped deep into the box with the ball falling to Sokratis on the edge of the area, who then put the ball back into the area with the outside of his foot and found his centre back partner Laurent Koscienly. The Frenchman tried to direct a header on goal, but instead the ball came off his shoulder and looped into the back of the Chelsea goal to make it 2-0. The home side looked to be cruising into half time with a comfortable lead but were given something to think about as Marcos Alonso's header from a corner struck the post on the verge of the break. The second half followed a similar pattern to that of the first, with Chelsea enjoying possession but creating very little. Arsenal did enough to secure an important win and gave the fans a lot to cheer about. Check out our breakdown of Saturday night's events below. Arsenal fans would've been looking for a response from their team after the disappointing defeat to West Ham in their last game, and boy did they get one. They came out firing in the first half and after getting their noses in front kept the pressure high on Chelsea, with the visitors having no answer to Arsenal's attacking threat. Their high pressure style of play continued from the first whistle right until the last and had the fans on their feet for the majority of the game, seemingly giving the players a second wind of energy when they needed it the most. It was an important win which closed the gap between the two sides to just three points, leaving the Gunners just one place below the ​Premier League's top four. Starting XI: Leno (7); Bellerin (7), Sokratis (7), Koscielny (8), Kolasinac (8); Torreira (7), Xhaka (7), Guendouzi (7); Ramsey (8), Lacazette (9), Aubameyang (7). Substitutes: Maitland-Niles (6), Iwobi (6), Elneny (6). STAR MAN - It was a much-needed win for Arsenal, and ​Lacazette stole the show on the night. He gave his side an early lead thanks to a very well worked individual goal, and continued to pester the Chelsea back line. Lacazette is a proper player. He was fantastic today. Not only was he effective going forward, he tracked back and put in a number of very well-timed tackles to win the ball back for his team when they really needed it. He got a standing ovation when he was subbed off and rightfully so after what was a fine performance from the Frenchman. WORST PLAYER - He didn't have a bad game at all, but on a night where there were a number of star performers, Lucas Torreira had a relatively quiet game. He did what he had to do in the middle of the park and kept things tidy but didn't make an outstanding contribution to the game. It was more the case of his teammates simply outshining him, although Torreira won't be too disappointed with his showing on the night. Right from the first whistle, Chelsea just never looked at the races on the night. They were overwhelmed by an Arsenal attack who looked possessed at times, and they had no answer to the onslaught. They fell behind early on and, despite having a lot of the ball, never really created any chances of note as they struggled to break down a stern Arsenal backline. Their lack of a presence up front was very evident and is an issue which will likely be addressed in the coming days. It was a night to forget for the fans who would've left the ground with very few positives to take from the game. Starting XI: Kepa (5); Azpilicueta (5), Rudiger (6), Luiz (6), Alonso (7); Kante (6), Jorginho (6), Kovacic (6); Pedro (6), Hazard (6), Willian (6). Substitutes: Barkley (6), Giroud (6), Hudson-Odoi (6). STAR MAN - On a night where there were very few good performances, Alonso proved to be Chelsea's biggest threat at both ends of the pitch. He went closest to scoring for Chelsea when he saw his header come off the outside of the post on the stroke of half time, and proved to be a threat down the left hand side. Even in defence, he made a number of well-timed challenges and had it not been for him, the score line could've been a lot worst for the Blues. It wasn't Alonso's finest performance in a Chelsea shirt at all, but he can at least hold his head up high on what was a disappointing night for the club. WORST PLAYER - He's usually known as Mr Reliable for Chelsea, but Cesar Azpilicueta struggled to hold down the right hand side for his team. Going up against both Sead Kolasinac and Pierre-Emerick Aubameyang, the Spaniard had no answer to Arsenal's attacking threat and suffered the consequences as a result. Kolasinac is way better then azpilicueta. Yeah yeah Azpilicueta have been good for us this past years, i tink its time for him to go. It wasn't just his defensive performance which was poor. He made a number of silly mistakes whilst in possession and never proved to be a threat going forward on what proved a night to forget.